"Shame on You: The Western Swing Dance Gang"
Bloodshot Records, Chicago's "Home of Insurgent Country", and our friends at Soundies, are proud as hell to launch our second release of our subsidiary imprint -- ladies and gentlemen, witness what will be a dazzling array of goodies from country music's storied past -- brought to you by BLOODSHOT REVIVAL! Now what you've got in your hands is from the King Of Western California Swing -- SPADE COOLEY. 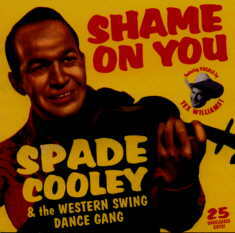 "Shame on You: The Western Swing Dance Gang" contains never-released recordings of Spade and his band -- some are so rare that in many cases they are the only recorded versions of the songs. Recorded over 1944 and 1945, they feature the vocal talents of Tex Williams (who went on to solo fame behind hits like "Smoke! Smoke! Smoke! That Cigarette! 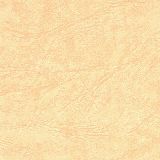 "), and showcase Spade and Tex at the height of their collaborative efforts. These are beautiful recordings from country music's seminal glory days back when "Outlaw Country" came from real murderous outlaws. So give yourself the freedom to admit this record swings even though you may believe that Spade should have been kept behind bars. Chicago-based Bloodshot Records, working with Soundies, has launched a new imprint called Bloodshot Revival. The imprint will concentrate on issuing unreleased recordings from country greats. The debut release will be Rex Allen's The Last Of.The Great Singing Cowboys, due out on March 23. Allen recorded the songs from 194~~949 during his stint on Chicago's radio show "WLS Barn Dance." Bloodshot Revival's second release will be Spade Cooley's Shame On You: The Western Swing Dance Gang, due out on April 20. The Western California swing artist recorded the album's tracks in 1944 and 1945, and they include collaborations with vocalist Tex Williams. Future releases in 1999 will include collections from Ernest Tubb, Sons Of The Pioneers and Hank Thompson. The CDs will be re- mastered from the transcription lacquers, and will also feature period artwork and liner notes.